No matter which model you select, the units are managed and maintained by Aquaplast according to on-site requirements. They are all simple to operate with intuitive software prompts, field proven, robust and designed for the UK. Growers benefit by having a complete service provider giving a complete irrigation solution ranging from selection, commissioning, servicing, maintaining and trouble shooting. Features such as Greenline which is referred to as HMI (Human Machine Interface) packages are available as extras at a very reasonable cost. This software allows the users to control or just view, the units via their desktop, laptop, tablet or smart phone allowing real time decisions to be made no matter where you are on your farm or indeed the world! Ripple Aquaplast are a UK distributor for NDJ drip irrigation products. NDJ are the worlds largest irrigation company and they are absolute world leaders in drip irrigation. Not all drippers are the same and the NDJ range surpasses all others by some margin and its use in nursery stock is becoming more popular due to its extremely accurate application of water and fertiliser. A well designed drip irrigation system from Ripple Aquaplast will add value to your stock and allow you to manage growth with more accuracy within the operation of a season. We can supply a variety of options to irrigate trees, specimen shrubs as well as smaller containers depending upon requirement and budget. Ripple Aquaplast offer integral driplines again non or pressure regulated depending on application both of which supply water to the soil in such a way that a constant level of moisture can be maintained in the key areas for plant growth. Of course fertiliser application is crucial here and with all our system design we ensure minimum wastage. Ripple Aquaplast pioneered the use of SPACE in the UK during the 1980’s. SPACE Sprinkler profile and coverage evaluation is a clever piece of software that allows us to evaluate sprinkler performance within a certain set of design criteria. SPACE allows designers to place sprinkler heads in almost any configuration and combination it calculates the uniformity and then displays the coverage using actual sprinkler test data. This, therefore, allows Ripple Aquaplast to demonstrate economic comparisons of different sprinkler layouts to assess feasibility of upgrading an existing system or choosing a new system. Pulling all this together for the UK nursery stock industry means that where sprinkler applications are required Ripple Aquaplast can offer a solution which is put together with results in mind. 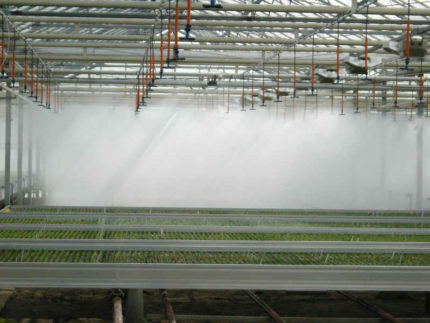 Using the NaanDanJain sprinkler range Ripple Aquaplast are able to fulfil all requirements for glasshouse and tunnels. Single or multi bay simultaneous operation, droplet size manipulation to manage distance, height and throw trajectory for percentage coverage within the walls of the structure plus precipitation rate all equate to a level of efficiency which gives the grower maximum control over his water application. Once again we use CIT’s SPACE demonstrable software. It allows educated decisions and therefore correct decisions, to be taken based on theoretical results. This is vital for any sprinkler selection. Using the extensive range of NaanDanJain plastic and metal sprinklers, Ripple Aquaplast are able to offer solutions which cover every eventuality. You may have a windy site, dense foliage, small or large beds. Perhaps even a limited water supply. Whilst all these provide challenges, they are challenges that we are able to accept and solve. We use CITs SPACE sprinkler software to theoretically demonstrate prior to any decision being made allowing growers to select the best solution for their needs and practices.